Like many tracks of its nature, ‘Bassline’ began its journey as an underground track and has since risen to possibly become somewhat of an anthem. 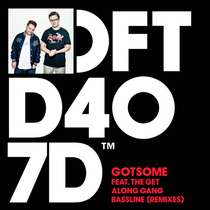 Defected Records released the Bristolian duo GotSome’s debut last year, with ‘Bassline’ promptly climbing No. 4 in the Beatport House chart. Now, with so much remix potential the track has been picked apart by some of the greatest minds in house music. Up first is house legend Kenny Dope who provides a duskier rendition that commences with pounding off-beat percussion and pitched-down vocals before erupting into a wave of convulsing ethereal synths. Friend Within darkens the tone using echoing vocals and sinister synths to make way for a drop consisting of 2-step percussion and a sullen hook. Finally, established duo Chocolate Puma demonstrate their high-octane approach to house production with a prolonged build-up that progressively elevates before hitting a monstrous barrage of throbbing low-end and thudding kicks. It’s out 17 February, check it out below.